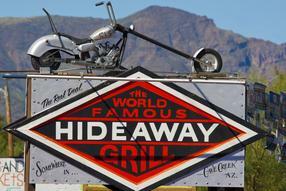 Often referred to as Arizona's most popular biker bar, the Hideaway is one place everyone should visit at least once. One never knows who the might bump into as it is often frequented by folks from every walk of life including rock stars and TV personalities as well as motorcycle royalty. 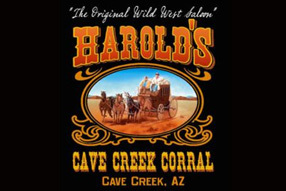 Located right next door to Extreme Arizona, Harold's is Cave Creek's oldest western style bar and grill. It has been here since 1935 when the main drag was just a dirt path. Harold's is the most popular Pittsburgh Steelers bar in the country. A quick visit to their website will give you some indication of this places incredible history. 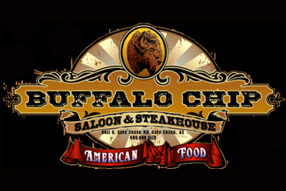 Located right next door to Harold's and right across the street from the Hideaway is the Buffalo Chip. The chip, as locals call it features professional bull riding on Wednesdays and Fridays and live music and dancing 7 nights a week, never any cover charge. 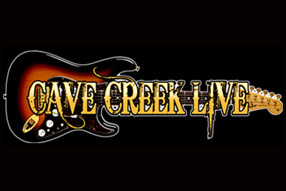 Visit Cave Creek Live for more information on all of the events happening in ton throughout the year. Cave Creek is know for its many parades, rodeos and automotive and motorcycle events.